Yes it is home turf for Nokia, so the Lumia range will have a bit of an advantage, but the steady progress of Windows Phone devices in Finland from an almost standing start in January this year to just under 20% share will be welcome news for Nokia. 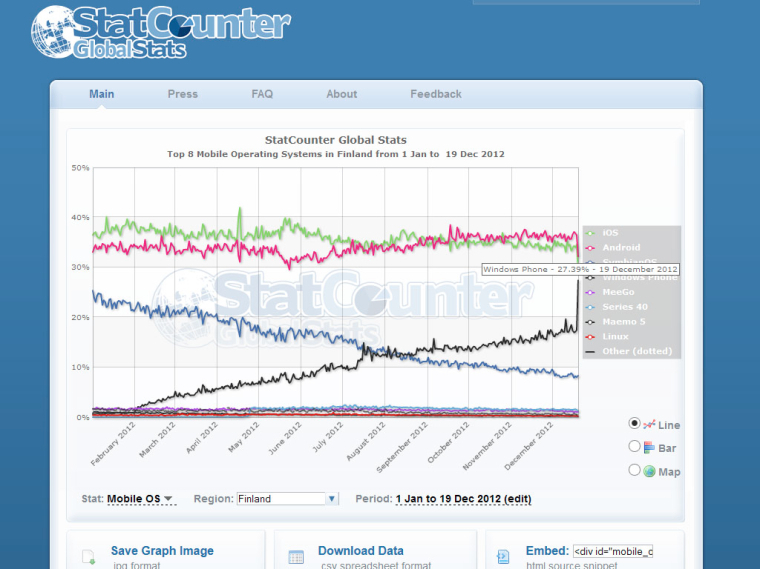 The readers over at MyNokiaBlog have picked up on the StatCounter numbers for device adoption, and while iOS and Android are trading the top slot between them, their share over the last year has been relatively stable. But the Windows Phone share? It's almost the inverse of the Symbian share. Which of course is the rough plan - have those leaving Symbian OS jump to Nokia's Lumia range of handsets. Of course this is just one territory, and Nokia have a huge amount of name recognition, but it does show that Windows Phone is a platform that, with the right conditions, can grow and become a significant part of the smartphone market. Now to have that replicated by every manufacturer, in every territory, during 2013. More numbers and thoughts over on the post at MyNokiaBlog.